When you can’t find a recipe on the internet, it’s time to experiment. This is sort of a melding of a Bobby Flay and an Epicurious recipe. 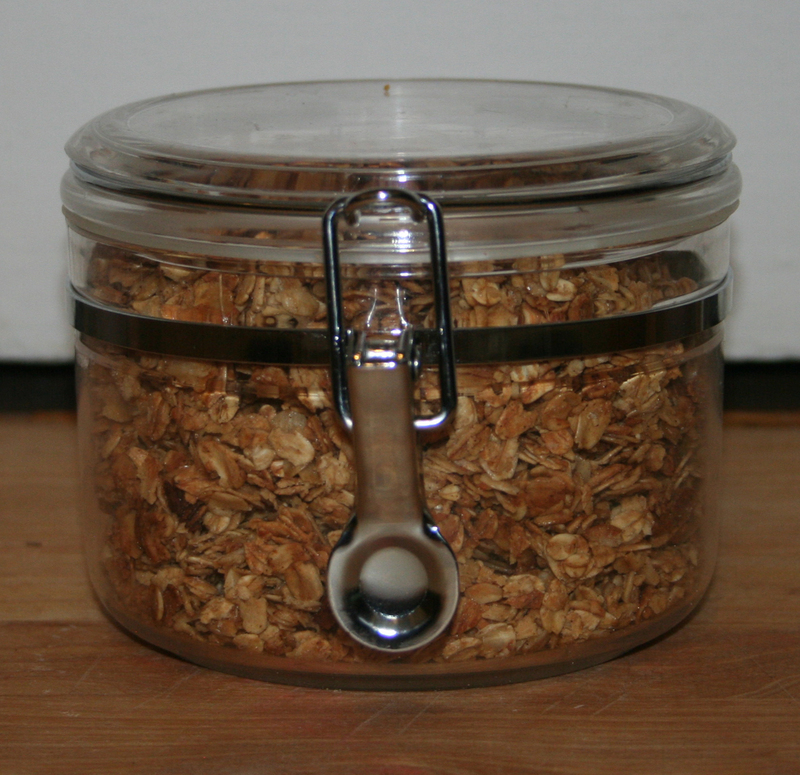 I am into the idea of making your own granola, but I hate that it can be so packed with sugar. This uses agave nectar instead of some of that sugar- but still has the right amount of sweetness. This recipe is very adaptable, so go crazy. I enjoyed some w. milk- and some in a giant bowl w. greek yogurt, maple syrup, pomegranate seeds, bananas and raspberries- delicious. If you are having people over for brunch you could, as mrs. weiner suggests, make into pretty parfaits- layering the yogurt, berries and granola. Let’s also talk for a minute about vanilla beans- which can add a great boost of vanilla flavor. Unless you shop at the co-op, these can be pretty expensive [just to tell you how awesome the co-op is (again) i’ve seen them cost $7 for one bean, and at the co-op you get 3 beans for $1.44.] Sometimes they come in glass viles, be sure to store beans in these or other air tight container, otherwise they dry out. To use, run your knife down the bean, splitting it in half lengthwise. Then run your knife down each side, scraping up all the little black specs onto your knife. Add specs to whatever you are flavoring. You can put the scraped out bean in a little jar, fill with white sugar, close, wait a week- and boom- vanilla sugar. Great to have on hand for things like this, french toast, baked goods etc. Preheat oven to 325. Line a baking sheet with parchment paper or tin foil. Whisk together honey, oil, agave, vanilla, cinnamon and sugars. In a large bowl, mix together oats, salt and any seeds/wheat germ/nuts. Add wet mixture to dry and coat thoroughly. Spread on baking sheet. Cook 25-35 mins- stirring once- until crisp and golden brown. Put baking sheet on cooling rack, allow to cool slightly, then break into chunks. Mix in dried fruit. Let cool completely and store in an airtight container. I think it could keep for at least a week, though mine disappeared much more quickly.